A report on two regional rail services in the Shonan area located 50 km southwest of Tokyo. Shonan Monorail and Enoshima Electric Railway are short lines which serve the eastern part of the Shonan region near the Tokyo Metropolitan area. Shonan is a regional name of the area located 50km to 80km southwest of Tokyo along the coast of Sagami Bay. The area includes two prominent sightseeing spots, Enoshima, a scenic island along the sandy beach, and Kamakura, an ancient city well as well known as Kyoto. This is a brief report on both regional railways. Shonan Monorail is a suspended monorail system, legally an electrified railway that connects between JR Ofuna station, 48 km from Tokyo on the Tokaido main line, and Shonan Enoshima. Its 6.6km route mostly runs along the ridge stretching through the western suburban area of Kamakura. The land along the line was developed mostly in the 60s and 70s, and it is now a populated residential area. 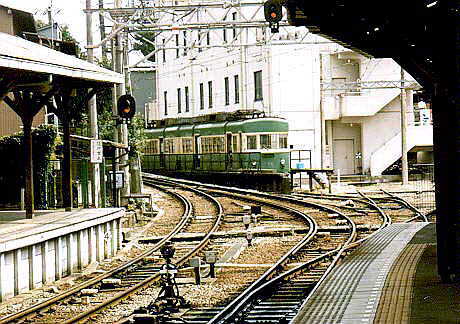 The system first started service for the Ofuna and West-Kamakura segment in 1970, followed by opening of the remaining section in 1971. Now the line busily serves residents in the area including commuters who work in Tokyo and Yokohama. 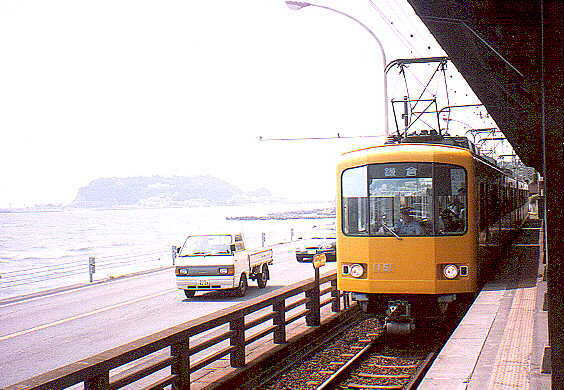 Another patronage of the line is tourists who visit Enoshima. During holidays, the trains are fairly busy with picnickers including bathers in summer visiting the Enoshima area from Tokyo and Yokohama and surrounding areas. Let's try the monorail. 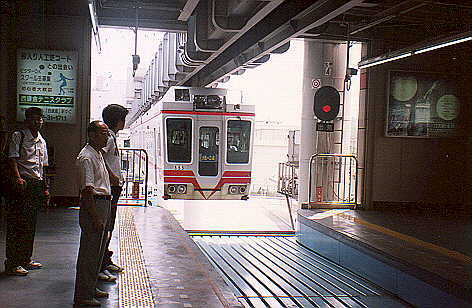 The line's Ofuna terminus is located just east of JR Ofuna station on an elevated structure several meters above the ground, adjacent to the station's department store building. 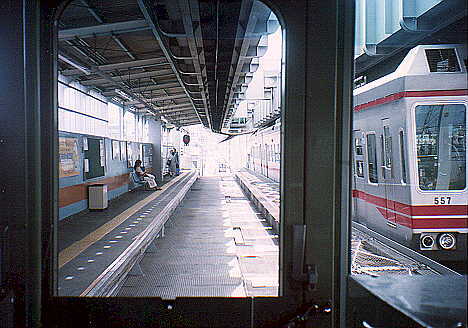 Inside the station are two platforms sandwiching one home track. With several features such as ticket vending machines outside, automated ticket gates and a color light signal erected on the edge of the platform, the station looks quite the same as an ordinary train station. The only difference is that there are no rails on the home track. Instead, you will see the overhead guideway which contains a pair of tracks and guide rails, one positive power feeder hung from the top and a pair of negative power feeders on the side walls. The car's trucks, suspending the carbody, roll along the tracks inside the guideway with rubber-tired wheels. The line is electrified with 1500VDC. The entire route consists of a single track with four interlocking stations and two intermediate stations. The system's facilities other than infrastructure include DC power feeding systems, an ABS system with commercial frequency track circuits, two- indication color light signals, relay interlocking, an ATS system and a CTC system with a computerized dispatching system, which means that the monorail is operated under much the same technology as for ordinary DC electrified railways. It is interesting that the track circuits apply the same technology as that used for ordinary electrified railways, utilizing a pair of negative feeders with impedance bonds. According to a time schedule displayed in the station, trains depart every seven minutes even at off-peak during the daytime. Quiet a good frequency as a single track railway. After an automatic announcement reported the approach of a train, a three-car train rolled in, shaking the station structure a little. I got on the train. Thank goodness, the cars are air-conditioned. Inside the car, there were mostly box seats, and short seats alongside the windows around the vestibules. A builder's plate indicates that the car was made by Mitsubishi Heavy Industry Co. in 1970. 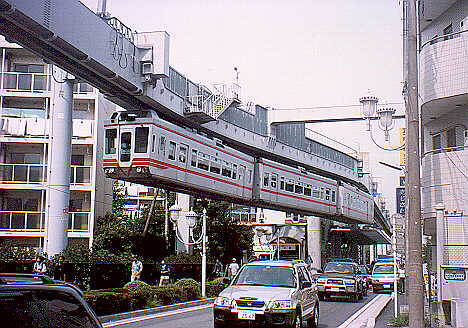 Mitsubishi is the only supplier of suspended monorail systems in Japan. After an automatic announcement for a dispatch, the train started. The two- person crew on board are a pair of an engineer and conductor. Soon the train began picking up speed. Quite nice acceleration, but unlike ordinary railway EMUs, the traction sounds were hardly audible (quiet!). Since the line goes along the hills, there are a number of ups and downs together with some sharp curves. The riding comfort was a little bit strange, because of occasional bumping with small vibrations and swinging as we rounded through the curved tracks. The next interlocking station came in view. The aspect of the home signal was yellow over yellow, which indicated a restricted speed for proceeding into the station, because of meeting an opposing train. The train slowly pulled into the home track, and sure enough, there was the opposing movement of a train entering the station along the opposite home track. After the train stopped at the platform, the conductor was busy collecting tickets from the passengers getting off. All stations are unmanned except at either end. Since the train runs up in the air about 10m high, visibility out of the train windows is quite nice, and rather spectacular. The scenery is filled with green trees along the hillsides, although the areas have been fully developed. At Shonan Fukazawa, there is the car depot and maintenance workshop site together with the company's main facility, which includes the dispatching center. A lead track to the depot diverges from the main track just ahead of the station. I passed the switch portion of the track, catching a glimpse of a train parked on one of three sidings in the depot. I saw some position-light signals in use for switching movements around the switch and leading track. After passing Shonan Fukazawa, scenery along the track turned somewhat rugged, like in the mountains. Soon, our train entered a short tunnel. A monorail running through a tunnel is quite a unique feature. Then, I saw a distant signal glowing green over yellow predicting the yellow over yellow of the next home signal. After a bit, we emerged from the second tunnel, and my train finally arrived at Shonan Enoshima, the other terminus. Like Ofuna, this terminus has a simple station configuration with one home track. I enjoyed the 15 minute monorail ride. Track layouts of Shonan Monorail and Enoden lines. This line starts from JR Fujisawa station on the Tokaido main line, 51km southwest of Tokyo, and links to Kamakura on the JR Yokosuka line, covering about 10km along the scenic coast. 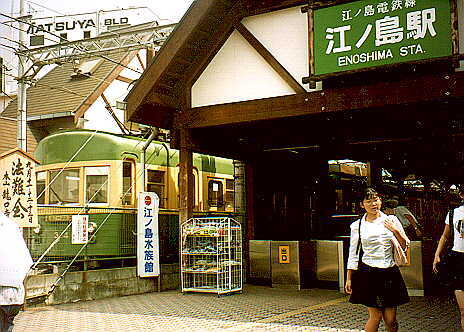 Situated around two prominent tourist spots, Enoshima and Kamakura, the railway serves as a convenient transport means for sightseers who visit the neighborhood. The line also serves as a commuter transit for workers and students in the residential areas along the coast. The line, loved by the people in the neighborhood, has the nickname of "Enoden." The "Enoden" has a fairly old history. 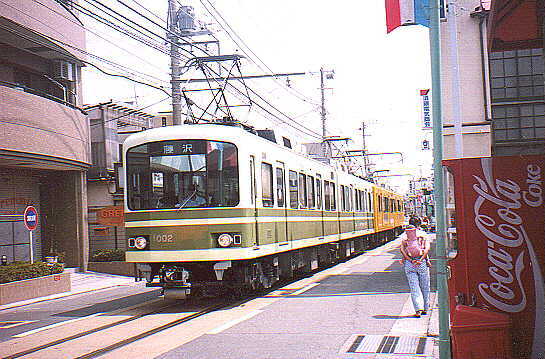 Its origin dates back to when it was opened as a tramway between Fujisawa and Enoshima in 1902. The entire trackage was inaugurated in 1910. The line used to be a slow tramway and had small tramcars for long time; the ridership of the line once even declined in the late 60s. However, passenger demand was soon restored and it started growing with the increase of population around the neighborhood and worsened traffic congestion on the road alongside the line. Due to the railway company's efforts in improving service, its rolling stocks and facilities, ranging from the signal system to station platforms, have been greatly modernized. 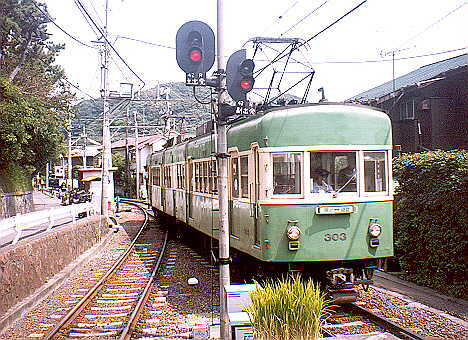 Now, its old tramway features have almost disappeared, and it serves rather as an interurban railway linking Fujisawa and Kamakura covering the pleasure resorts along the route. However, with small trains running slowly because of the many sharp curves and closely neighboring houses, the railway still holds a bit of the tramway image. The 10.1 km route consists entirely of single tracks with six interlocking and nine intermediate stations. The line uses 3'6" (1,067mm) gauge and is electrified with 600VDC. The entire route is signaled with simplified ABS systems along with an ATS system. Trains are operated with two cars or four cars at about 12-minute intervals all day. During busy tourist seasons, the trains all run with four cars. Let's try Enoden from its Enoshima station, which is located close to Shonan Monorail's Enoshima station, just across the street. This station retains a somewhat magnificent feeling with wooden architectures, including on the platforms, reminiscent of the good old railway days. There are four short sidings at the eastern end of the station. A 4-car train (two sets of 2-car unit) pulled in. The cars looked rather old with livery of green and light yellow, but surprisingly, the front unit was air-conditioned. 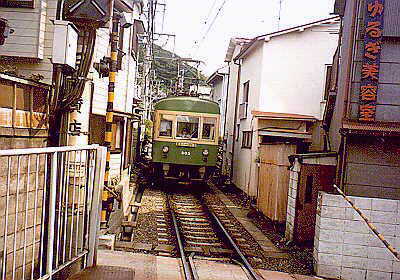 The train started and soon emerged to a narrow street. 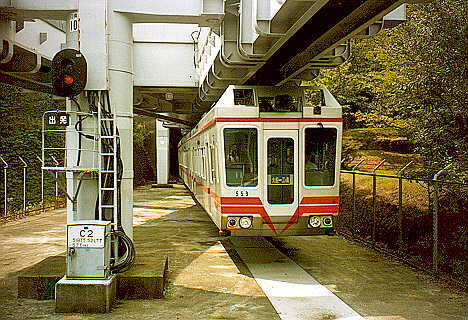 A track about 300m long east of Enoshima station is the line's only street running section. The train slowly rolled along the street. Then, the route suddenly left the street and entered a crowded residential area. The train slowly proceeded along the track on an aisle alongside which houses are densely built. You almost feel you can touch the eaves or windows of the houses out the window. I do not know any other place where a railway track runs close to the neighboring houses like this. My train came to the seaside. The sea was glistening in the distance, and the crest of waves were showing white spray. The train picked up speed and rolled on along the solid track. I saw a string of automobiles lined up on the parallel road between the rail and the shore. In contrast to the congestion on the road, the train proceeded smoothly. After passing two intermediate stations, my train arrived in an interlocking to meet an opposing train. This interlocking is provided just for the purpose of meets between trains, so no passenger facility was seen. This is a unique feature of a suburban railway situated near the Tokyo metropolitan area. The switches in use are not powered, but are movable by means of oil pressure (the closed tong rail is broken into by the flange, and then automatically returns to the previous position; this type of switches is called a "spring point"). After passing this interlocking, the area along the track turned out to be a residential area lying along the foot of the hill stretching west of Kamakura. The train slowly rolled on again along the track closely surrounded by houses, sometimes stopping at an intermediate station. With plenty of greenery, the area looked quiet. At every interlocking station, there was a meet with a train going in the opposite direction. Along this railway, because of the absence of restricted speed indications on the home signal, if one train is in motion toward the home track, the other train has to wait outside the home signal until the first train clears the switch section. After a while, my train passed by the depot. The maintenance facility with several sidings looked quite modern. The leading track directly diverges from the main track through a powered switch that is protected by switching signals. Soon, the train reached Hase, the closest station to Kotokuin Temple, where a great Buddha sits outdoors (the Buddha, made of bronze, is over seven hundreds years old). Some sightseer groups got off the train, and in their place about the same number of passengers got on. My train finally rolled into Kamakura station, which is located adjacent to the elevated JR Kamakura station on the Yokosuka line. From here, you can directly reach Tokyo station within one hour if you catch a Yokosuka line train. 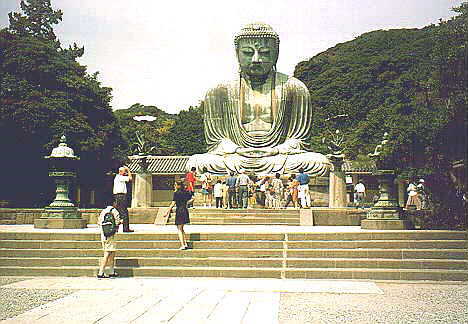 Kamakura is an ancient city that, from 1192, was the country's capital for over one hundred years. In the city, there are 65 Buddhist temples and 19 Shinto shrines, most of which date from that time. I like both short lines. If you have a chance to come to Tokyo, please do not miss railfanning both the Shonan Monorail and Enoden, extending your trip to the Shonan area.